It’s difficult to grow up in today’s world without running into Big Bird and Elmo somewhere! Sesame Street brought learning to broadcast television in the US in 1969 and ever since, the lovable Muppets have captured the hearts and minds of children all over the world, through Sesame Workshop’s international co-productions. In fact, in Nigeria, the Sesame Square television show reached nearly 8 million children between the ages of 3-7 years, and its Hausa language adaptation Dandalin Sesame remains on air today. Through Sesame Workshop’s school and community-based programs, children in low-resource countries are able to learn with the Muppet characters even without access to broadcast television. 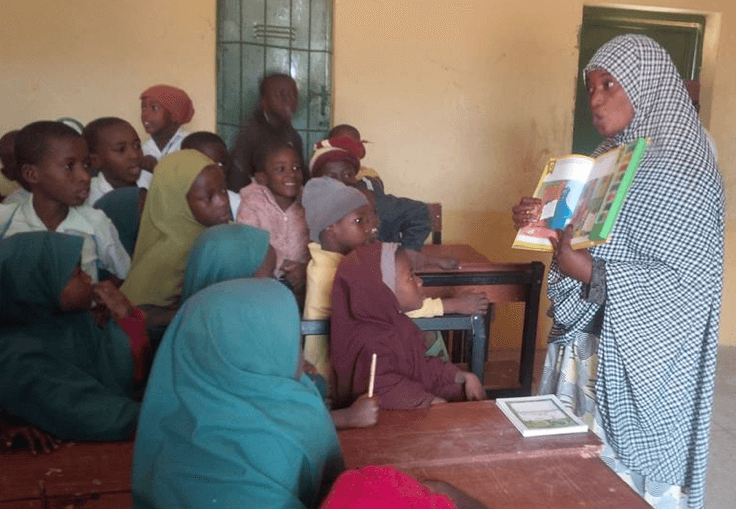 From 2013-2015, through generous support from USAID, the Abuja-based Sesame Square team was able to create Hausa literacy materials for use in public primary schools in six states in Northern Nigeria. Given the challenges of limited literacy levels in the region, along with variation in pronunciation, the team recognized the immense value of the Speaking Book for supporting young children as they developed early literacy skills in Hausa. 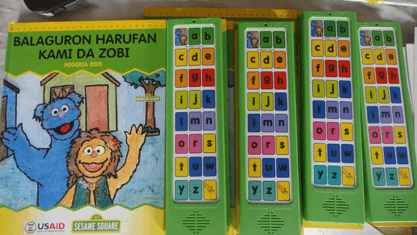 Through a partnership between Sesame Workshop and Speaking Books, a new Hausa alphabet book featuring Kami and Zobi, the Muppet stars on Sesame Square and Dandalin Sesame, was born. This Speaking Book gives children the opportunity to practice proper pronunciation and communication skills in the language of their environment. The full toolkit aimed to support children’s learning and literacy also includes Hausa Alphabet Flash Cards and A Story Tree Mat. 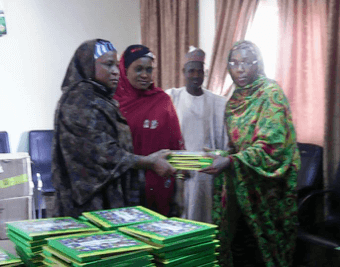 The Sesame Square team distributed the Speaking Books, along with the other learning materials, through a series of teacher trainings in the public and Islamiyya schools in Northern Nigeria. A set of Master Trainers were selected from the State Universal Basic Education Board (SUBEB) to lead step-down trainings that would prepare educators to use the learning materials in their classrooms. Sesame Workshop is the nonprofit educational organization behind Sesame Street and so much more. It’s mission is to help kids grow smarter, stronger, and kinder. It’s grown into a worldwide educational phenomenon, reaching millions of children in more than 150 countries.